Looking out over the expanse of the North Sea, the masterpiece that is Kingsbarns is quickly becoming legend. In spite of its youth, Kingsbarns Golf Links is talked about in the same breath as famous names like Muirfield, Pebble Beach, and the Old Course. Perhaps the most celebrated course of the 21st Century, Kingsbarns is now considered to be one of the best layouts in the world. 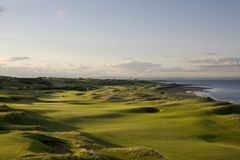 Located just 20 minutes down the coast from St Andrews Links, a visit to Kingsbarns is an essential part of any bucket list Scottish golf break. The most popular option is to stay in one of the great hotels in St Andrews and enjoy the coastal drive on your way to a round of golf you will never forget. Every single hole is spectacular, and a round here demands mastery of every shot in the game. Another beauty of Kingsbarns is its understated style; there are many such courses being built now for exclusive private membership. Here all are welcome to play, and to use the small, understated but luxurious clubhouse and locker room. If one was forced to choose a signature hole, most would plump for the awe-inspiring par-5 12th. The hole dog-legs left, hugging the coastline, and the brave will be tempted to challenge the green in two blows with a hard draw. There is trouble everywhere you look here, but it is the sort of course that inspires the golfer to great feats. For any golf aficionado, Kingsbarns is an absolute must-play. Keep your approach shots below the pin - the vast greens have some harsh slopes. Kingsbarns is just amazing from the moment you arrive till you finally leave the bar its a very special place in golf. Service like few others and the location 5* plus. Kingsbarns was fantastic, we can't speak highly enough of the course, clubhouse etc. Best one we played (better than the Old and New at St Andrews) in our opinion.